In this update, we focus on issues that were topical throughout the first quarter of 2019. We look at a number of emerging laws and initiatives and what they mean for you. On the 11 April 2019, the UK and EU agreed to extend the date of the exit of the UK to 31 October 2019. However, if the UK achieves a domestic agreement prior to that date, the date the UK could leave the EU would be sooner. Moving to a flexible leave date adds complexity to business planning for Brexit and SUEZ recycling and recovery UK amends its preparations accordingly. SUEZ along with other major waste management companies has been working closely with DEFRA to ensure there is a plan in place whatever happens with the negotiations between the EU and the UK. The UK Government continues to signal that it will pass the revised waste directives into law once it leaves the EU. The revisions are linked to the Circular Economy Package and are planned to be approved before the UK leaves the EU. Until a clear picture of post Brexit conditions becomes available, SUEZ will continue to ensure that its business, and services to its customers, are as resilient as reasonably practicable to the array of potential risks. This is an ongoing and iterative process and we follow political developments closely, along with guidance from both the UK Government and European Union on potential or actual outcomes. We are actively responding to queries from our customers regarding the contingency plans and the impact these may have on our customers. We have been feeding into the options appraisal work and helping to influence policymakers. We are focusing on contingency planning in respect to fluctuating exchange rates, refuse derived fuel (RDF) exports, freight costs and labour. In late March 2019, SUEZ participated in a roundtable hosted by DEFRA, where progress was reviewed and feedback shared. As it stands DEFRA does not see any significant changes in the way shipments will be controlled post Brexit and of the 55 statutory instruments that require a change due to Brexit, 42 changes were signed off and the remainder will be passed through in the next few weeks. Holding increased levels of critical spare parts in our energy-from-waste facilities to cover most expected requirements from the scenarios being modelled. in HR management and employee retention through the period. In collaboration with our European sister companies, we have worked with regulators to seek to understand and promote solutions to potential issues such as the export of waste to Europe. Much progress has been achieved through Article 17 clarifications on RDF export for instance. Furthermore, we have contracts with refuse off-takers in the UK, which provide some domestic resilience. We have reviewed our port-use strategies and sought to widen our export port base and minimise potential disruption from port congestion. We are promoting similar Brexit risk-analysis processes with our key subcontractors and their respective supply chains. We are seeking to maximise available storage of consumables (such as diesel fuel) to maximise resilience where possible. We are helping our employees to understand and respond to any new requirements, such as those required by the EU Settlement scheme. Where equipment is being replaced or updated (for instance with collection vehicles) we are putting in place contingency measures to keep existing equipment operational, should delays in the supply of new equipment occur. As we reported in previous issues of our quarterly Legislation Update, the UK Plastics Pact, a collaborative initiative, set out to create a circular economy for plastics was launched in April last year. The pact brings together businesses from across the entire plastics value chain with UK Government departments and NGOs to tackle plastic waste. SUEZ recycling and recovery UK was a founding signatory of this ambitious initiative with a goal to transform the UK plastic packaging sector by meeting four targets by 2025. Infrastructure development (retrofit and innovation). An update on the achievements and learnings from the work of the Pact carried out in the last 12 months is due to be published in May 2019. The Social Value Act (2013) requires those commissioning public services to consider how they can secure wider social, economic and environmental benefits from the services they are responsible for. In November 2018, the Cabinet Office Minister, David Lidington, announced new measures, which would use contracts as a “force for good”, by requiring public sector procurement to take social and economic benefits into account in certain priority areas, and these are expected to be in place by summer 2019. This was reaffirmed through DEFRA’s Resources and Waste Strategy for England, which commits to extending the 2013 Act, by requiring government procurement to evaluate and account for social value in its processes, placing the environmental impact of procurement at its heart. Developments in this area are also expected in 2019. The European Commission’s (EC) Single Use Plastics Directive was first proposed in May 2018, and approved by the European Parliament in October 2018. The directive was granted full approval on 27 March 2019. At the session in Strasbourg, 560 MEPs voted in favour, 35 against, with 28 abstentions. The directive only has to pass through formalities before it is published in the EU rulebook. Once that happens, EU member states will have two years to implement the directive. This far reaching directive targets the 10 single-use plastic products most often found on Europe’s beaches and seas (straws, cotton swabs made from plastic, plastic plates and cutlery, plastic coffee stirrers and plastic balloon holders), which it intends to ban. of plastic food containers and cups used for beverages, according to a timeline of six years after the new rules have been transposed. Extended producer responsibility (EPR) is also in the spotlight. According to the directive, the existing systems will have to help fund the clean-up of litter. For tobacco products with filters, wet wipes, balloons and fishing gear, new extended producer responsibility systems will have to be set up. The Single Use Plastics Directive delivers on the commitment made in the 2018 European Plastics Strategy to tackle wasteful and damaging plastic litter through legislative action – a move that has been welcomed by the European institutions and citizens alike – including SUEZ who has been supportive across Europe. The new measures proposed will contribute to Europe’s transition towards a circular economy, and to reaching the UN Sustainable Development Goals, the EU’s climate commitments and industrial policy objectives. The overall aim is to support safer and more sustainable consumption and production patterns for plastics. Under the proposed directive, items such as plastic straws, cotton swabs, disposable plastic plates and cutlery would be banned by 2021, and 90% of plastic bottles recycled by 2029. SUEZ recycling and recovery UK fully supports the proposal from DEFRA for a far reaching Environment Bill, a requirement as we exit the European Union to hold government to account for environmental policies and practices. We have been part of a number of industry working groups advising DEFRA on the development of the principles and governance (initial consultation document was released on 18 December 2018). We have fed back through our involvement in a number of cross-industry working groups – Aldersgate Group, Broadway Initiative, and of course the ESA. Our position has always been that we need a strong ‘environmental watchdog’ that can hold government to account and that has real enforcement powers to challenge government and its agencies. This will ensure that targets remain fixed, and enable us to invest in long term infrastructure to meet the new targets without concerns that policies won’t be adhered to and strategy direction might change at short notice. DEFRA is intending to use the outcomes of the Resources and Waste consultations alongside its other policy measures, to finalise and introduce the bill to parliament in late June to early July 2019.
on 18 December 2018, building on its 25 Year Environment Plan which was published in January 2018 and first highlighted the government’s commitment to reduce plastic waste, using natural capital to assess future policies and interventions, and reducing food waste going to landfill. to change, and it is the first real new government policy in the UK since 2007, as since then we have relied on EC Directives to determine what we do in the UK. Move away from weight-based towards impact-based targets and reporting, focusing initially on carbon and natural capital accounting. SUEZ is pleased with the vision and leadership provided by DEFRA on what is an extensive strategy that will change, influence or impact every aspect of waste and resource management, from consumption to disposal, and through producers, consumers, managers and regulators. For a thorough review please see our initial thoughts of the sector on the day of release. The Budget in September 2018 set out how the government aims to accelerate the shift to a clean economy, building on the Industrial Strategy, Clean Growth Strategy, and 25 Year Environment Plan. can support investment in energy efficiency measures. The government also said it will advance the decarbonisation of gas supplies by increasing the proportion of green gas in the grid, aiming to help reduce dependence on burning natural gas in homes and businesses. The government also announced it has published a consultation on Infrastructure Finance, seeking views on how the government can best support private infrastructure investment in the context of the UK’s changing relationship with the European Investment Bank post Brexit. However, the Chancellor of the Exchequer said nothing new about waste and resources, other than reflecting on the live consultations of the revised Resources and Waste Strategy and his own consultation on beverage containers with less than 30% recycled content. David Palmer-Jones, CEO of SUEZ recycling and recovery UK, was quoted soon after the Budget Statement saying “Putting environmental concerns at the heart of taxation policy is the right strategy, if we are to create a sustainable economy which lasts not just a few parliamentary cycles, but into the lifetimes of our grandchildren”. push to use the taxation system to help change the way we produce and consume products and packaging, helping us to recycle as much as possible and to reduce the impact of waste on the natural environment. The Sustainable Clothing Action Programme is a voluntary programme for members of the clothing supply chain to collaborate to deliver a reduced environmental footprint from their activities. There are 88 organisations signed up to the SCAP 2020 Commitment, including SUEZ, who joined in winter 2018 as we recognised the increasing importance of clothing and wider textile issues. The signatories include a number of collectors, recyclers and charities that represent 65% of clothes sold in the UK by volume and 54% by sales value. This reduction will be measured per tonne of clothing. These targets are challenging, but after transport, utilities, construction, and food, the clothing industry represents the fifth-biggest environmental footprint of all UK industries. Over 16,000 tonnes of waste arising. Consumer action is crucial to meeting the targets, which is why the Love Your Clothes campaign has been developed in support. 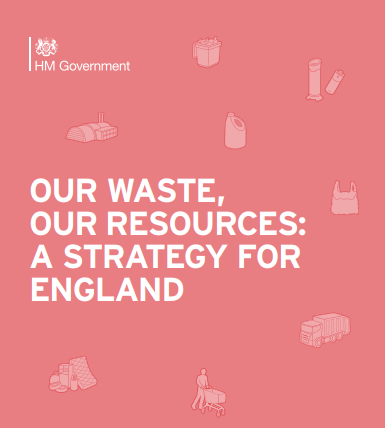 The Resources and Waste Strategy promised a number of consultations on areas that would require more detailed analysis and options comparison, and although delayed they were finally published on 18 February 2019. Extended producer responsibility (EPR) reform – which addresses full net cost recovery, how producer monies flow through the system, different models of governance and responsibility etc. Deposit return schemes (DRS) – the choice between ‘all in’ or ‘on-the-go’ solutions, with a focus on smaller containers or all packaging containers with differing models of cost and uptake etc. Consistent collections – proposals around which core materials must be collected to support EPR reform (dry packaging – metals, glass and plastics) plus paper, and a proposal for weekly food waste collections and free garden waste collections etc. A tax on beverage packaging (HMT led) with less than 30% recycled content – considers how to assess recycled content, whether individual containers are included or families of products etc. SUEZ was heavily involved in the early analysis, particularly around sector insight, peer challenges surrounding EPR reforms, DRS options and consistent collections. On the back of launching our own vision document in May 2018 of what an English Resources and Waste Strategy might deliver we ran over 40 workshops with the value chain, government departments, producers, consumers, the recyclers and reprocessors to test many of our ideas, explore solutions and inform the debate. It has been rewarding to see so many of these taken on board in the current consultations. We are now developing our responses, and have been working with customers, and the wider supply chain to understand the implications of many of the proposals put forward. The governance models for EPR either favour a centralised body or a market approach, with different proposed levies or fees. SUEZ openly favours a market-based solution, to help keep overall costs to consumers and society down, and also favour the deposit-based system as we feel this will drive greater innovation in packaging design and help finance the transition to new solutions and services. SUEZ also favours the new proposals that look to tackle municipal and commercial packaging under the same system, with similar payments and reporting requirements. Compostable packaging is currently excluded from the EPR reform, however we feel strongly that all packaging should be included right from the offset, and the same applies for the consistent collections consultation. In our opinion, DRS should not be consulted on in parallel to EPR and should be considered as one form of harvesting the target materials needed under EPR. We fear that it could prove an expensive way of capturing a few extra percent of packaging materials, when focusing on quality collected at the kerbside could be far more beneficial and affordable. SUEZ is concerned that our targets for 2025 and 2030 are unachievable because of the time lag proposed in putting in place both new legislation and funding. Even 2035 targets are at risk. A flat recycling target for municipalities won’t drive the performance we need, nor will it reflect a location’s ability to deliver the solutions needed to meet such targets. Suburban authorities can deliver higher recycling rates because of their housing stock and family types, with bigger gardens, more food waste and higher proportions of recyclables than many inner urban authorities, so bespoke targets based on local authority DNA is needed. Finally, the 30% tax will need a lot of work to show how it will fit alongside any EPR reforms and DRS introduction. We continue to host workshops, attend client meetings, and industry events to share our insights and listen to the debates, so please don’t hesitate to contact us should this be of interest.